Electronic games, such as MB Simon and Adman Grandstand, went on sale in the UK in the second half of the 70s. This was the time when people got their first taste of the digital lifestyle we enjoy today. A few years earlier, the first calculators and LED digital watches were marketed. Now manufacturers too adopted the same circuitry for play, and the age of electronic games began. This revolution was reflected in the small screen when ITV's George and Mildred's neighbours bought a Grandstand game for Christmas. There were also concerns that TV audiences would drop, with more people using their TVs to play video games instead. Granada TV's report "Who'll be watching Coronation Street in 1984?" expressed concerns their advertising revenue might be at risk. The grand daddy of all the computer games was the Magnavox Odyssey, which was launched in 1972. It introduced the public to a familiar, but primitive, electronic bat and ball game. Magnavox Odyssey was quite sophisticated; it offered range of different games, some of which required props. However, it was more of US than an UK phenomenon. Electronic chess games also appeared in the mid seventies, but the game that first captured the public's imagination in the UK was the Adman Grandstand. The Adman Grandstand came along in 1976-1977. It featured a series of games such as a version of the popular electronic tennis game, Atari Pong, which people were already playing. Other games included football, squash and shooting. Some versions included an electronic light gun. This games console was much imitated. 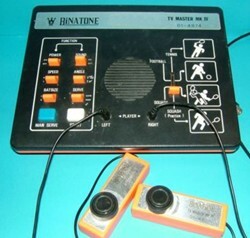 There were similar games made by Binatone such as the TV Master, featured at the top of this article. Other manufacturers included Optim Sport, Tandy and Prinztronic. If you want to buy one, look for complete sets in working order with the original box. What makes these games attractive is the design of the consoles which often featured the typical 70s' colour palette of brown, beige and bright orange. Look out for bright orange keys, wood effect finishes or brushed chrome. As with all collectables, condition is everything. The Atari 2600, introduced in 1977, took gaming to another level. It used cartridges which provided the logic for many variations. The games included the now familiar titles: Pac-Man, Asteroids and Space Invaders. The early models, manufactured in Sunnyvale California, are known by collectors as 'heavy sixers' as they have six switches on the console and weigh more than later models. Later models from 1978 onwards were made in Hong Kong. The model illustrated above is a later console. The simulated wood finish lasted until the early 80s and consoles with this finish were known as the Atari 2600 'Woody'. The Milton Bradley Simon game was available in the shops from 1978. It was MB's second electronic game. Their MB Logic 5 was launched a year earlier in 1977. Logic 5 resembled a calculator and presented the user with a numerical sequence he had to guess. Simon's bright four colour layout made it stand out in toyshops and it was a big seller. The game itself was fairly simple. You had to follow a sequence of colour combinations selected by the game's computer. There were four skill levels, thus giving it the addictive quality of all computer games: the challenge to rise to the next level. Simon was soon joined by a pocket version, Pocket Simon and a multi player version, Super Simon. The pocket version was also known as Mini Senso and Pocket Senso. The highly successful Invicta Mastermind spawned an electronic version, Electronic Mastermind, in 1977. It resembled a pocket calculator and was a similar game to the original version using numbers rather than coloured pegs. 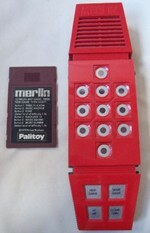 Palitoy Merlin, from the makers of Action Man, was introduced in 1979. It combined some of the features of Simon and Electronic Mastermind. It resembled a prototypical mobile phone. Electronic games from the 70s paved the way for further technological advancement in the 80s and the home computer boom, which started with the Sinclair ZX80. This site retrogamingcollector.com has a wealth of information about retro electronic games from the 70s and 80s. Also have a look at www.binarydinosaurs.co.uk which has a list of the various versions of the 'pong' tennis game and some pictures.